Benjamin Welton is a Ph.D. student at Boston University and a freelance writer. John Bolton, President Donald Trump’s national security advisor, took to Twitter recently to disparage the regime of Nicolás Maduro. In particular, Mr. Bolton vowed that the detention of opposition leader Juan Guaido’s chief of staff would “not go unanswered.” Roberto Marrero’s arrest was deemed “illegitimate,” and Bolton echoed the president, who has repeatedly warned Venezuela that “all options are on the table” concerning the conflict over that nation’s recent elections. This, the president confirmed, included the possibility of a military intervention. Maduro’s two biggest backers, China and Russia, have invoked the Monroe Doctrine in order to disparage the US’s efforts to ouster Maduro and his United Socialist Party. Ted Galen Carpenter, writing in National Interest, also invoked the Monroe Doctrine but in a positive light, arguing that the US needs to invoke the old policy in order to curb Moscow’s foothold in Latin America. With so many politicians and analysts invoking the Monroe Doctrine, you would think at least one would correctly understand the history of this controversial piece of American foreign policy. The inaccuracies permeating the recent analysis suggest Americans need a refresher on the nearly 200-year-old document. The policy sounded tough, but was essentially toothless. The American Navy in 1823 had just sixteen vessels of war, five of which were deployed in the West Indies. This force could not deter any serious naval armada, therefore the British Royal Navy, which enjoyed trading relations with several Latin American nations, became the enforcer of the policy. The Monroe Doctrine was as much of a British policy as it was an American one, and for the majority of the nineteenth century, the Monroe Doctrine benefited the British Empire more than it benefitted the American Republic. That changed in 1895. The reason? A border conflict between Venezuela and British Guiana. By 1895, the US fleet included fifty-five warships in total, with three brand new battleships commissioned that same year. While nowhere near the strength of a first-class European fleet, the US Navy was by that point a force to be reckoned with. The British found that out when London refused to accept international arbitration on the long-simmering dispute over the Schomburgk Line. The Venezuelan government demanded territory as far east as the Essequibo River. The colonial officials in British Guiana, recognizing that this would strip them of about two-thirds of their territory, countered these claims by demanding 33,000 square miles of Venezuelan territory west of the Schomburgk Line (so named because of the German-born explorer Robert Schomburgk). For nineteen years, between 1876 and 1895, Caracas petitioned the United States to intervene on their behalf against the British. It took a new US Secretary of State, Richard Olney, to finally grant Venezuela’s wishes. Olney sent a letter to Thomas Bayard, the American ambassador to Britain, demanding that London settle the dispute by arbitration. Olney invoked the Monroe Doctrine to declare that the United States, which had “greatly increased in power and resources” since 1823, had an interest in protecting the status quo in the Western Hemisphere. British Prime Minster Lord Salisbury responded by telling Olney that international law did not recognize the Monroe Doctrine. Rather than turn tail and save America from the possibility of fighting the world’s premiere navy, President Grover Cleveland, a Democrat and a firm believer in limited government and even more limited US involvement abroad, sent the issue to Congress. Congress met specifically to talk about the formation of a boundary commission. However, behind the scenes, a few American wives of British statesmen (including Mary Chamberlain, wife of Joseph Chamberlain) told their husbands that Congress could declare war. Their urging, along with a growing crisis with the Boer republics in South Africa, convinced London to back down. By October 1899, the issue had been resolved, with the United States declaring that the border should concur with the Schomburgk Line. By that point the United States had a full-fledged empire in the Caribbean and Asia. Following the impressive victory against the Spanish in 1898, American troops occupied Cuba, Puerto Rico, Guam, and the Philippines. In the span of four years, America had gone from saber rattling on behalf of arbitration to overseeing what amounted to the British Empire in miniature. In 1904, the Roosevelt Corollary gave serious muscle to the Monroe Doctrine, adding that the US military now had a responsibility to police the Western Hemisphere. President Woodrow Wilson, a hated enemy of Theodore Roosevelt, would nevertheless echo his predecessor’s policy by adding to the Roosevelt Corollary an interest in promoting “good governance” in Latin America. Under this idea, small batches of US Marines and sailors would occupy Cuba (1906-1909, 1912), Haiti (1915-1934), the Dominican Republic (1916-1924), and Nicaragua (1909, 1912, 1927-1932). American military governments established order, balanced the books, and tried to depoliticize Latin America’s ever-restive militaries. Under President William Howard Taft, the US also promoted dollar diplomacy, whereby US loans were leveraged in order to promote the ascension of pro-American leaders to power in Latin America. None of these developments would have happened had not the American government managed to get the British deescalate matters in Venezuela in 1895. This legacy is controversial to say the least. American occupation tended to promote improved public hygiene and free and open elections. Veracruz, Haiti, and Nicaragua all benefited from US intervention. However, Richard Olney’s descendants also left behind dictators like Rafael Trujillo and Anastasio Somoza Garcia, and by the time of the Great Depression, the United States had become the “Colossus of the North”— an imperial power which gobbled up Latin American resources and raw materials with a voracious appetite. Detractors of Washington’s current approach to the crisis in Venezuela reference this imperial legacy when they invoke the Monroe Doctrine. 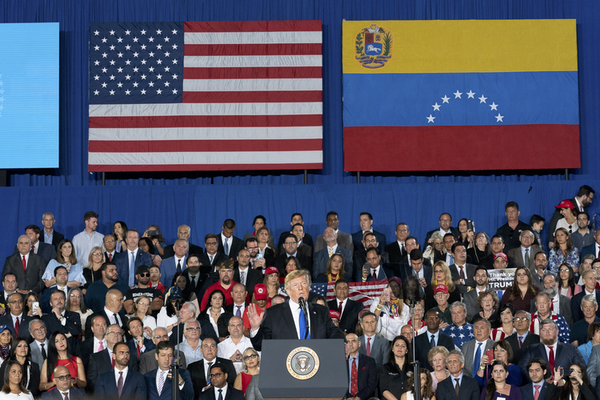 It remains to be seen what President Trump’s administration will do in Venezuela. Could it all be bluster, or is there a possibility of another Banana War-like invasion in the same vein as Grenada in 1983 or Panama in 1989? Either way, it is clear that the Monroe Doctrine needs to be seriously studied rather than bandied about by both anti-American powers and interests and war hawks. Simply put, the Monroe Doctrine was a complicated piece of legislation that genuinely attempted to protect the Western Hemisphere from Spanish revanchism. The policy changed once the United States became an economic and military power. Today, it would appear sound to not only study the history of the Monroe Doctrine, but to study the traditions of realpolitikin general. For the first time in a long time, a non-American power (Russia) has sent troops and material into a Latin American country in order to prop up an anti-American government. This does directly challenge American hegemony in the region, and now the question to the US is this: do you follow the traditions set forth by the Roosevelt Corollary to the Monroe Doctrine, or do you follow a new approach not constrained by historic precedent?